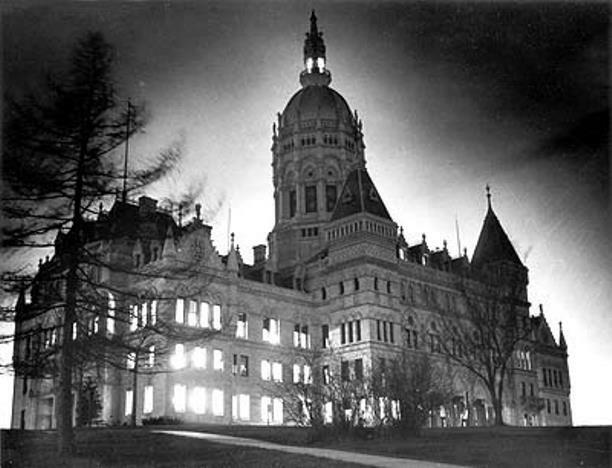 By the 1870s, the State’s practice of having dual capitols in Hartford and New Haven was considered awkward and ineffective. In a public referendum in October 1873, the Hartford faction carried the day by a narrow margin and New Haven ceased to be a capital city. When the legislature appropriated funds for a new building, the city of Hartford also donated money towards the building. The fifth state house in Connecticut’s history was built on land in Bushnell Park, where Trinity College, then known as Washington College, had previously been located. The statue visible in the lower right corner of the photograph is Thomas Church Brownell, the founder of Trinity College. Shortly after the building was completed the statue was moved to its present location in the quadrangle of Trinity’s location on Summit Street. Richard Mitchell Upjohn, a cathedral architect, designed the Capitol, which is considered to be in the High Victorian Gothic style, although it contains a variety of other influences as well. The building was completed in only six years, using marble and granite primarily from Connecticut and the surrounding New England states. The Capitol was named a National Historical Landmark in 1971, and the building underwent a complete restoration from 1979 to 1989. It is still in use today.